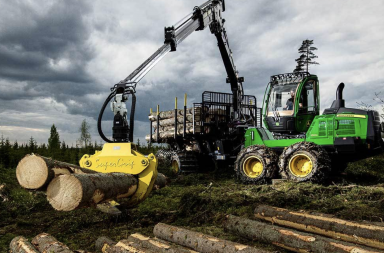 Since their FMG time in Filipstad in Värmland, Sweden, John Deere Forestry has always had a way of introducing new models by adding them to their old trusted 1270. This was also the case some three years ago, when the first harvester of the G-series saw the light of day with the 1270G. In some ways it has been three exciting years for John Deere, perhaps not in terms of sales, but they have moved on from the E-series to the G-series without an F-series, and in the middle of it all they have introduced crane tip control in their harvesters. 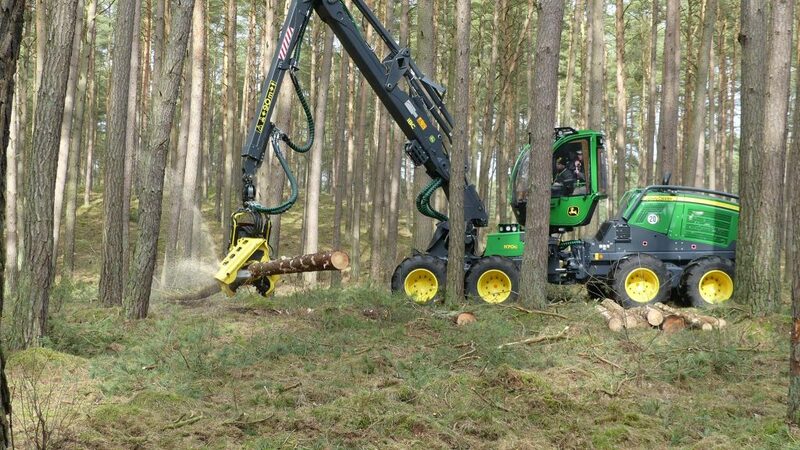 John Deere have named their crane tip control IBC, and the launch took place last year at Elmia Wood by adding it to – you guessed it – a 1270! And now, nearly three years later, the smallest harvesters are being launched in the G-series, with the two models 1070G and 1170G. Even though the 1070G will be available with 4WD and 34” wheels the 770-model is, sadly, now just a memory. 1070 has been John Deeres’ “small” thinning expert for a long time. The 1070G will be available with four wheels, but not eight like its big sister, 1170G (with four bogies). Sadly, the 1070G will also not be available right now with the new crane tip control. It would have been an interesting setup, a small strip road harvester with crane tip control for tight first thinning projects! Let’s hope that will happen! Instead, we will get to see how the JD 1170G with IBC will work in practice with the new crane tip control – that’s something we’ll have to follow up on! With the launch of the 1070G and 1170G John Deere has decided to update the color scheme. 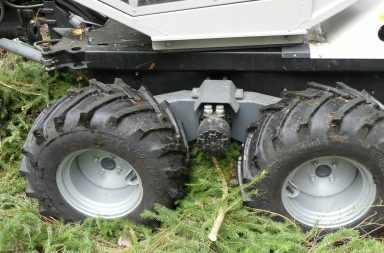 The frame of a John Deere (and a Timberjack) has always been black, at least straight out of the factory, and on a well-used JD-frame and bogie even of a red shade, presumably as the first layer of paint is revealed through wear and tear. But when ordering a new John Deere today you will be greeted with a shade of gray on the frame and selected (previously black) parts. Quite similar to the new gray of Rottnes, perhaps a bit lighter. Renewal is important, and decisions related to branding carry a heavy weight these days. Personally, I would guess that the new color will be well received among JD-drivers all over the world. Stage 4 engines, or no – stage 5 engines – are now found in both the 1070G and 1170G. The gap between stage 4 and 5 regarding emission requirements of diesel engines not made for the road is not a big one. If I dare to compare, I would say that it’s like driving from Ystad in Sweden to Haparanda (stage 3 to 4) compared to driving from Ystad to Tomelilla (stage 4 to 5). 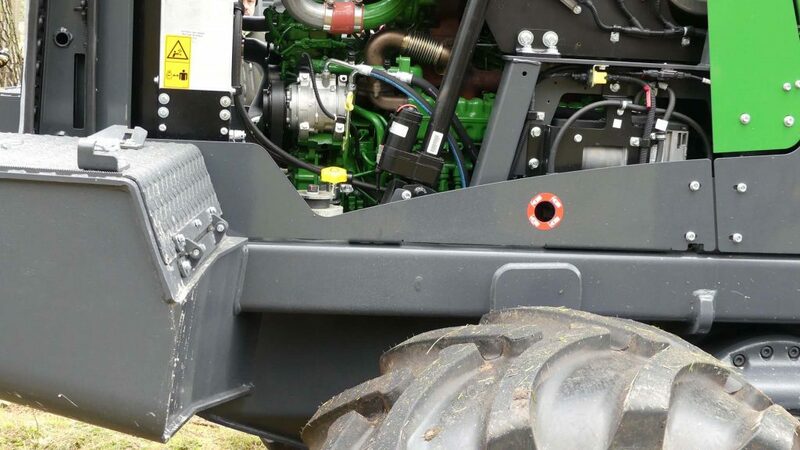 In other words, it’s a major gap difference between the two upgrades, and since the difference between FT4 and Tier 5 is not as big, John Deere has now decided to use Stage 5 compatible diesel engines even before it becomes the standard in 2019. With Stage 4-5, urea, also commonly called AdBlue-solution, has been added. 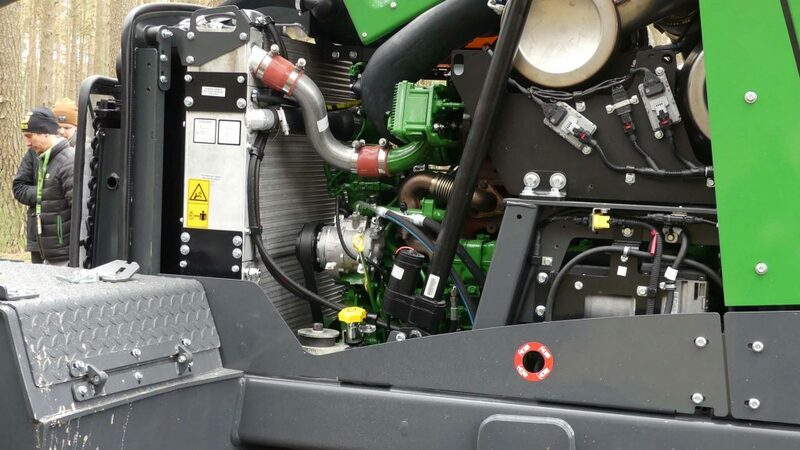 John Deere has chosen a solution with both DOC, C-EGR and DPF. With this, the use of urea is reduced to around 3% of the fuel consumption, according to JD. The engines of the 1070G and 1170G are from John Deere’s own engine factory in France. It’s the old 6-cylinder PowerTech™ 6068 of 6.8 litres that has been upgraded to handle the new emission standards and driver requirements. If we stay with the 1070G, the effect of the engine has been raised to 155 kW and 978 kNm. The 1170E IT4 had the same block but 145 kW and a maximum of 935 kNm. The effect has, in other words, increased by around 6%. 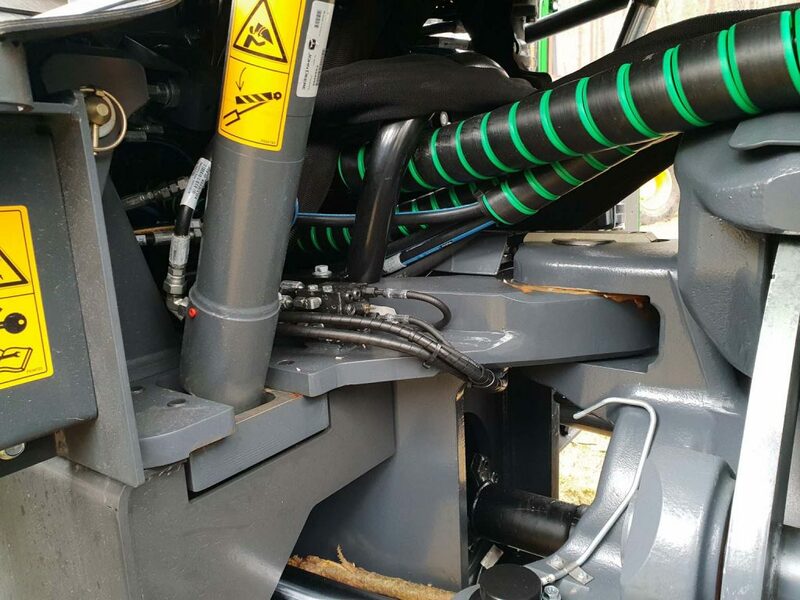 The reason, according to John Deere, is primarily an improved powertrain which, in turn, is necessary to improve terrain abilities of the eight-wheel harvester. With the G-series John Deere has also made the decision to switch positions of the engine and hydraulic pumps. Now, the engine is located in the back of the back frame (which is similar to most manufacturers) and the pumps, including tanks, closer to the waist of the same frame. The advantage is reduced noise levels in the cabin. A notable improvement, if you ask me. I’ve driven a lot of the E-series and when I got to try the G-series, the difference was significant. This despite the fact that they have not modified the cabin in this regard, according to JD. 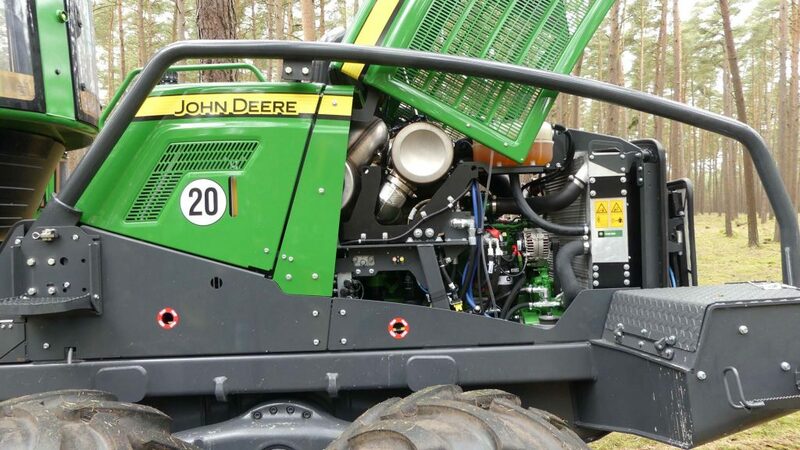 John Deere are very proud of their engines – their own tests show that fuel efficiency has been significantly improved compared to the IT4 engine, and on top of that production has gone up. 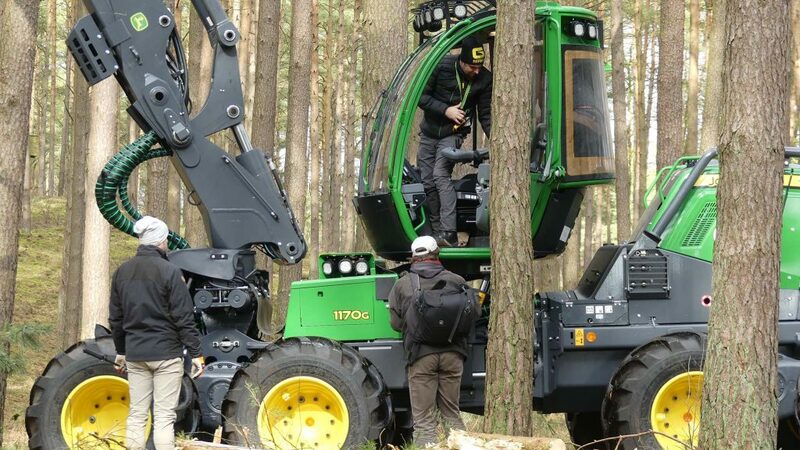 Naturally, this improvement should be a given and it will be exciting to hear reports from the forests when the harvesters of the G-series are launched at a larger scale. A new addition to both harvesters is ADC – Adaptive Drive Control. 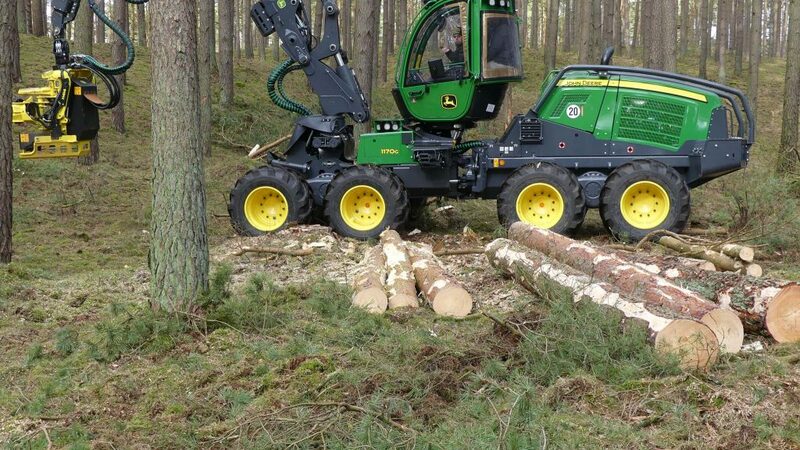 ADC was presented on the forwarders at Elmia Wood 2017, and now the harvesters are getting the same boost. The system is largely a software that adapts power and performance based on current conditions. The engine, pump and hydrostatic drive are constantly adjusted in a way that is meant to ensure sufficient power levels for the task at hand without going overboard. ADC is, according to John Deere, a significant contributing factor to a reduction in fuel consumption when working in rough terrains. The fact that John Deere chooses to make the 1170G an eight-wheel version is not a coincidence. 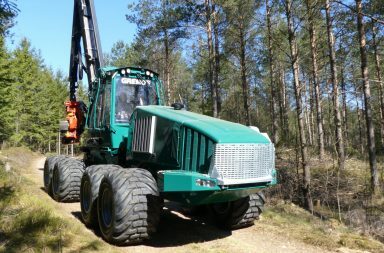 Warmer winters with more rain raise buoyancy requirements, and the central European market (which is closing in on the Nordic market) is practically screaming for forest machinery with good buoyancy, usually not of the caterpillar type which means that four bogies is the way to go. 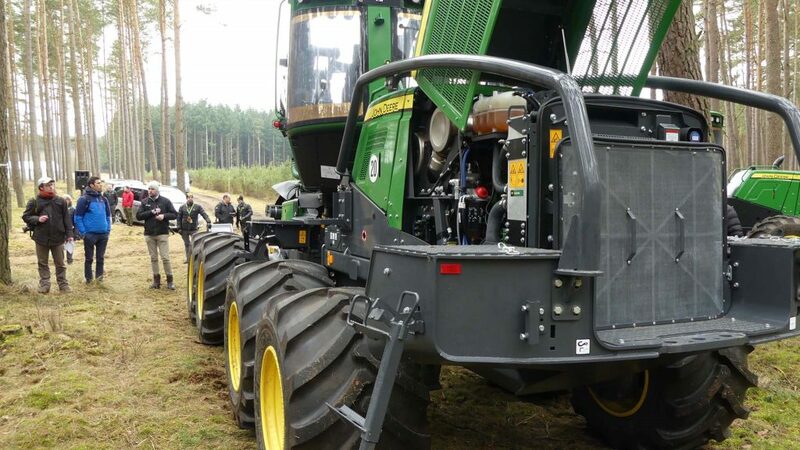 That the machine is also more stable must be seen as a positive side effect in this case – 8WD is popular in for example Germany! Eight wheels means a greater weight, but the advantage with extra wheels supposedly weighs heavier than the added total machine weight. A 1170G 8WD with H414 should weigh 20.500 kg. The frame has received a makeover and some improvements can be seen in the G-series. A new ladder to the cabin is something I believe a lot of people considered a must – more than a few ladders of the E-series broke at the bottom step. This has now probably been redeemed. A new addition is a separate ladder to reach the engine. You can now easily step up on the left back wing and then stand behind the engine to get a good view when the hood is up. In this wing John Deere has placed a tank and pump for the urea-system. The AdBlue tank can hold 25 liters. With the G-series, John Deere has also focused on the visibility of the driver. They have pulled out some magic tricks regarding the engine space, and despite a Stage 5 engine with DOC, DPF and Urea they have managed to lower the height of the engine space – an improvement to backwards visibility. 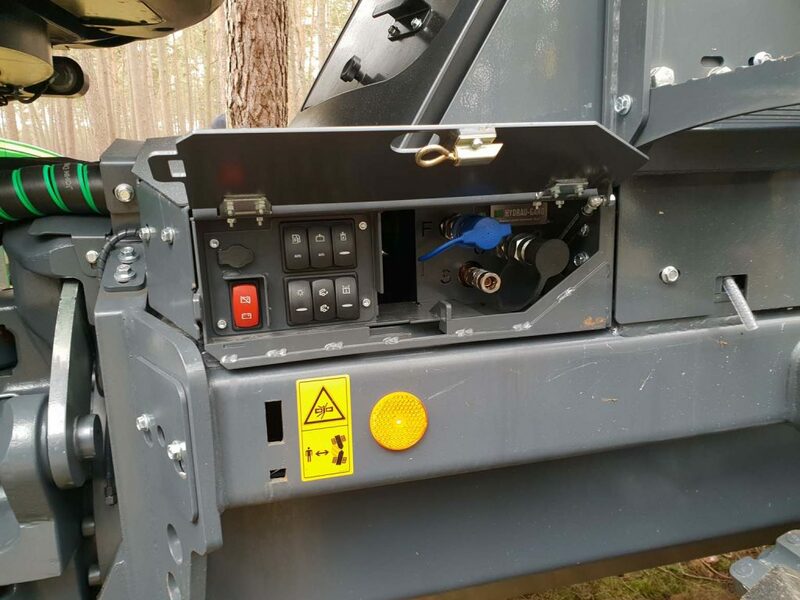 A new service panel has been fitted to the back frame. Pull up the hatch and you’ll find the maneuver functions required for servicing, including refueling diesel as well as hydraulic oil. The crane is standard for the 1170 – CH6. It comes in two lengths, 10 or 11.3 meters, and is as previously mentioned available with crane tip steering – IBC. Previously, the big brother, CH7, was alone in this. John Deere has replaced the work pump with one that’s 8% larger in the 1170G. The new one is of 190cc while the old one had a displacement of 175cc. The carry weight of the CH6, however, remains unchanged, and the maximum size of the harvester unit is H414 (H412, H413 and H414, all from Waratah, which is a company that is owned by John Deere Forestry). The 1170G that was shown had an H414. 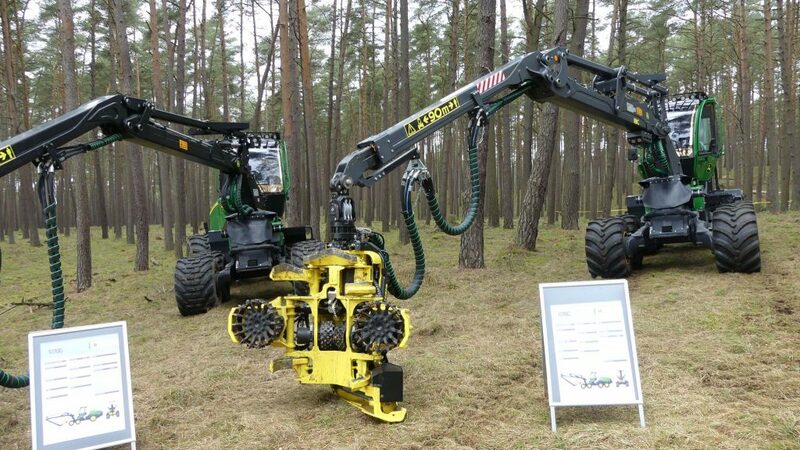 This is the second largest 4WD harvester unit of John Deere. It can possibly be compared to the Ponsse H7 and Komatsu C123. In other words, it’s a unit not typically used in previous first-time thinning projects, nor in the general final felling. The H414 can cut up to 62 cm and weighs 1.100 kg. It is normally not a coincidence which specific setup is used on a showcase machine. Since the showing was in Germany it is likely that a 1170G with H414 will be a good choice there. 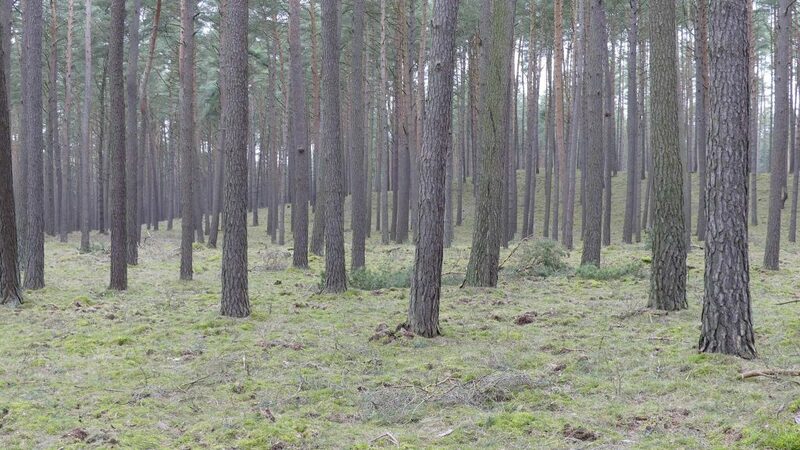 Their forestry is different from the Nordic one, with a closer population and larger timber stock as a result. An 1170G with H414 can ideally be used for weaker, stamped, third and fourth time thinning tasks in Germany, where this combination should work well. Probably a mid-size trunk, around 0.35 m3fub. Form a technical point of view the 1170G should not leave anyone disappointed. The new control of the powertrain with the new engine will most likely be well received on all markets. But the possibly greatest improvement is IBC, the crane tip steering. At the time of writing John Deere are the only manufacturer to have two serial harvesters with IBC. IBC eases and increases productivity overall. Perhaps not among the very best drivers, but for those who are not at the top. The advantage for the best of the best should instead be reduced stress, something all drivers can enjoy. We have also seen a strong trend toward using these so called “mid harvesters”, and naturally John Deere are working to meet this trend. Personally, however, I would have been more excited to see an 8-wheel 1070G with IBC and 12-meter crane, and a small unit with multi-tree handling. With the same or smaller width compared to the 6WD 1070, but with 24.5” wheels. This does not make the new machines from John Deere any less of a feat, though, as it’s only my personal opinion. 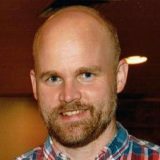 An opinion from a Nordic forestry perspective, which can sometimes be both narrow-minded and ill-advised from a financial perspective! Feel free to ask questions and discuss below or in the forum!